On March 29th , Leonard Nash (the handsome athletic one, not the one who just lost 10 lbs and still looks chunky in PINK!) 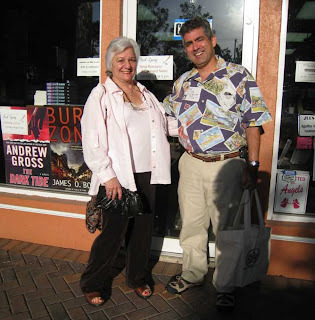 read from his short story collection, You Can’t Get There From Here, winner of the 2007 Florida Book Awards Silver Medal; and yours truly read from her collection of poems, Cooking Lessons at Murder on the Beach Mystery Bookstore in Delray Beach to an amazing little crowd that posed evocative questions Leonard and I were happy to answer and made the small event memorable and fun! Thank you, Leonard, for the lovely reading and and thank you, Joanne Sinchuk, owner of this delightful book shop. and a special, heartfelt thanks to all those who attended!